I mean word spacing, some words are sticked together like this example, "Whatshould we do?" and sorry but, after playing the game one time I'm not planning to make a second re run anytime soon so I won't be able to help and post typo screenshots. Don't have the time yet. selius: As far as I'm concerned, the main problem of the Angelg is that it doesn't get much in the way of hit bonuses on its weapons, and Lamia doesn't get Strike. Since AP has a lot of dodgey enemies, that makes things much harder. The Weapons are in the separate table. But you're probably better off getting yourself a strike spirit cheatcode or something. Thank you. I've always wanted to play and understand this because of the classic robot shows it featured. Reading through the Biographies, I have a question about the original Japanese dub of Daimos: was Richter never referred to as a prince there? I've read the page on Wikipedia and Richter is described as both an admiral and a prince. I've seen a local dub and he was called as a prince and a "commandant" so I wonder if it's one of the changes made by the translators. I also wonder similarly about Grand General Leon, because Wikipedia also describes him as an Emperor (that's his only title in the local dub). I just want a clarification from those with better understanding of the anime because unlike Combattler and Voltes, I didn't find an English-subbed, Japanese-voiced original. Hello, I hope I can shed some light on your questions. First let's talk about Leon and my choice for his rank of "Grand General". The kanji used in Japanese were 大元帥 (Daigensui), which happen to be the same as the Great Marshal of Hell. Since I used that as an "evil" rank, I decided to translate it in a different way to make it feel nicer. Since he was the highest military rank of Bharm, I made him a Grand General. Leon himself wasn't an Emperor; basically after the catastrophe of Planet Bharm there were no other living important people excluding the top military ranks. There might have been an emperor or a king, but he probably died. Richter and Erika aren't royalties, unlike Heinel (his parallel from Voltes). Thank you. That answers it but it's harder to accept than the name changes and Nana being Kazuya's younger sister. Richter and Erika being royalties just made so much sense in the local dub, unlike Nana and Kazuya being siblings, that I thought that it's in the original. Olban was even a regent that rules in Richter's place because the latter was said to be too young and inexperienced and forcing Erika to marry him is supposed to be a way to usurp the throne (the two of them were even wearing crowns during the ceremony). If Erika wasn't even royalty, then I guess he's not usurping but instating himself as a monarch and he's just a dirty old man who wants a beautiful young bride. Can someone please update this cheat code? I've just finished playing through the game with both Axel and Lamia, and would like to do a "messing around" run. 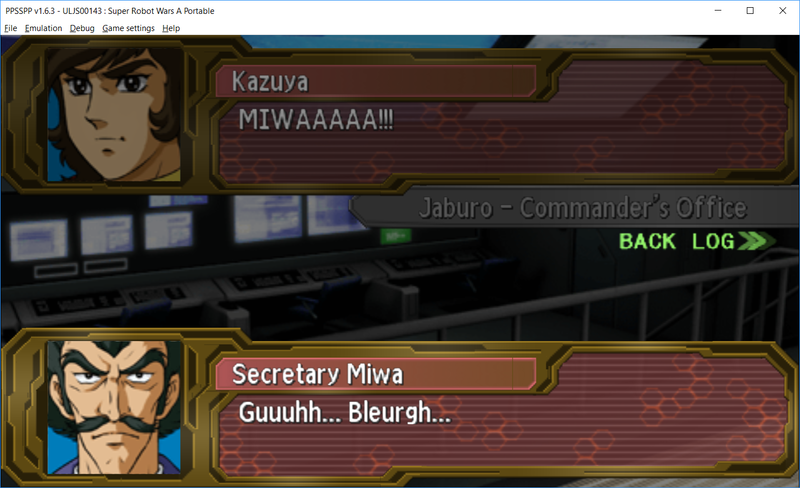 Nice to see another fully translated SRW game! The work and effort you guys put in is definitely greatly appreciated. Nana isn't actually Kazuya's sister, they grew up together so they're almost like siblings, but they're definitely not relatives, only childhood friends. Nana is the granddaughter of Prof. Izumi, who was a friend of Kazuya's father. Also yeah, Olban just wanted Erika because she was beautiful, he didn't need her to become royalty or anything. Post mission, Chapter 4, when you "unlock" her. 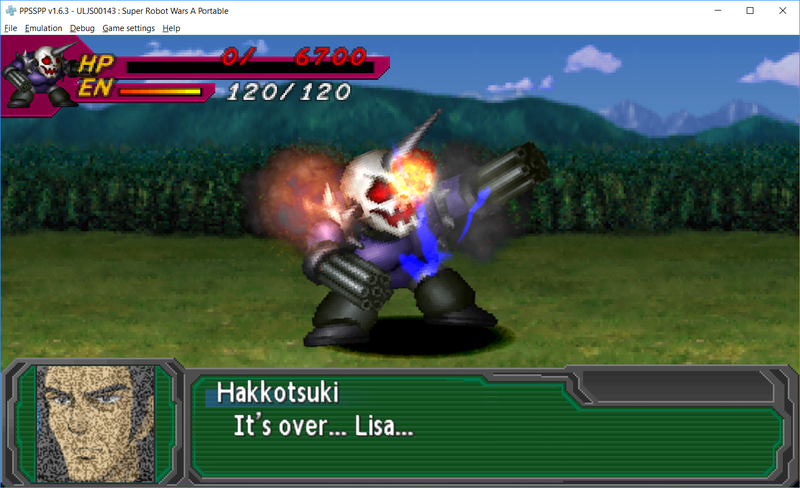 I'll get a screencap of Hakkotsuki's "losing in combat" dialogue later on, where she most often refers to her as "Lisa". 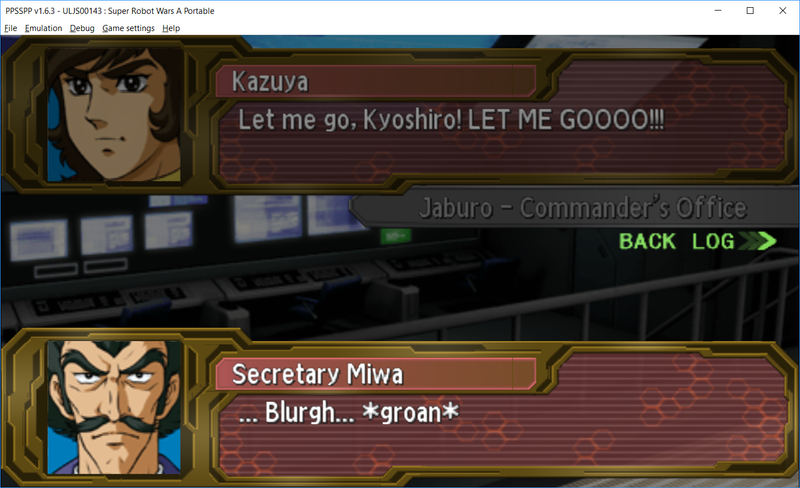 I really, really appreciate this english patch, especially since I can't truly enjoy playing SRW without reading the dialogues firsthand. However, I have some feedback regarding the names of Aschenretter and Weissretter. I think it'd be better to stick to the more canon names (Ashsaber/Ashsaviour and Weisssaber/Weisssaviour respectively). Although you have explained your reasoning behind this in a post, I find it weird to not use the more canon names whenever possible. I can rename my unit, but not when it's my enemies'. As I just recently got to the latter stages, I also notice that Lemon sometimes says "Weisssaviour" in her battle quotes, which add to the oddity. Furthermore, it would be confusing if one newer to SRW would try to look up information for these two units. I also find the name Weissretter to be both too close with the name Weissritter (although it was your intention to, but it was a one-letter change regardless), and makes it sound more like it's a sister unit of the Weissritter, instead of Ashsaber/Ashsaviour/Aschenretter with inspiration from Weissritter. On an unrelated note, why the decision to translate "Atare" as "Fire"? This I'm just curious. I hope I don't sound rude with this comment, and I'd like to thank again for this fan translation. Really enjoying the game. It wasn't made clear if the dubbing intended for them to be biologically related but trying to rewrite her jealousy of Erika because of her own crush on Kazuya into overprotectiveness of her brother just doesn't work. This translation is really helping me get a better glimpse of Daimos's original story and it was released at a time when I'm at the early stages of writing a SRW fanfic with Daimos in it, though I'm keeping some of the mistakes I made by relying on the dub. I also have a comment regarding when the Dragonar pilots call the Practice Squad pilots as kids. The original word they use is "obocchama" and though the regular meaning is young master, their sarcastic way of saying it is equivalent to calling them spoiled brats. I think "spoiled brats" or just "brats" might fit better because "kids" just doesn't carry the same hostility that the original quotes have. I suspect the Lisa/Risa confusion is further amplified by the fact that Daitarn 3 also has a character named Lisa, and that the decision might have been made to go with 'Risa' for the Getter character to disambiguate but not all the relevant lines got edited, or something. Just an outsider's view on the situation. 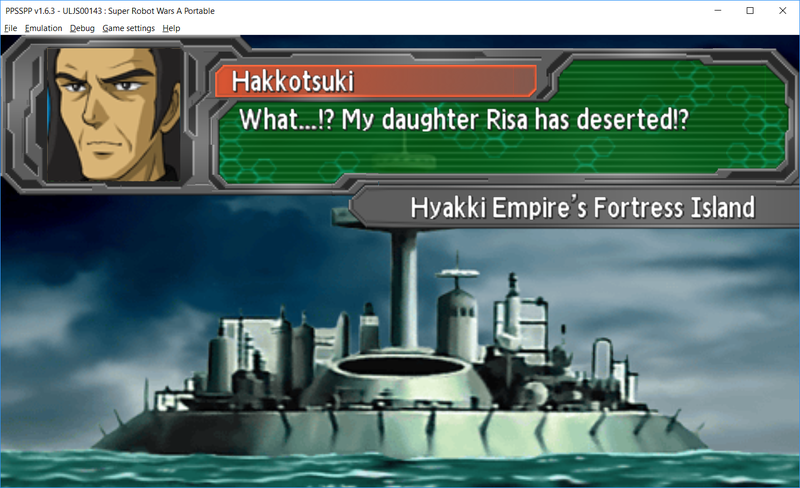 Also, I've gotten a bit of a ways into my current campaign (Chapter 18) and haven't encountered Hakkotsuki again to get another screencap. 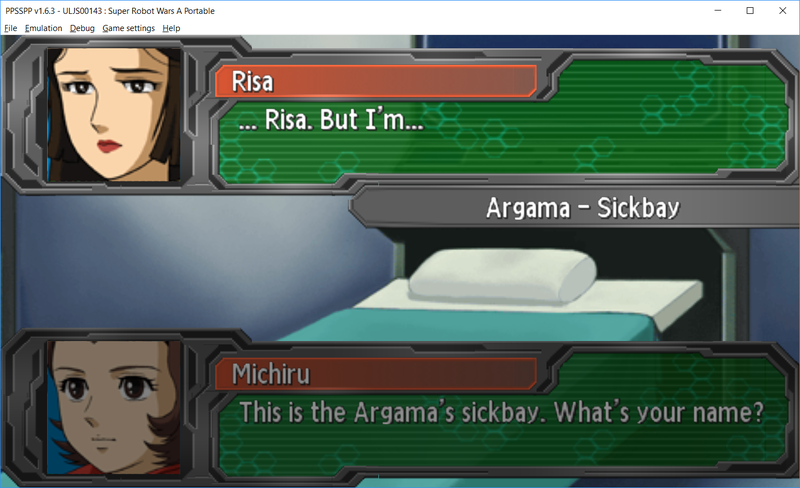 But I'm pretty sure she only ever refers to "Risa" as "Lisa" in combat after you defeat her/destroy her mech. Everywhere else, including the "Biographies" call her "Risa". I just remembered that there is a chapter where Hakkotsuki commits suicide once she realizes her daughter is alive and is now working alongside the Getter team. So yeah where was my head at? :/ I'll never see her in combat again unless I restart the campaign. yeah, I caught that too late, it's fixed internally so it'll be in the fix patch when it's ready to be released. Whenever i used "Luck" and "Guts" skills, ppsspp crash. Any solutions? I think this might be an emulator issue and not something introduced by the translation patch. Maybe something to do with the "Graphics Renderer" setting? Maybe you're using the "Vulkan" renderer? I know that this renderer causes the game to crash immediately after you start the first chapter mission. If so, then try using the other renderer, Direct3D 11 works fine on my end. Also I don't use the "Luck" Spirit Ability as I do have the Infinite Funds code enabled. As for "Guts" I do use it sometimes and the game hasn't frozen on me yet. Okay I tried using the "Luck" Spirit Ability of one of my characters who had it and nope, no emulator crashes on my end. So yeah, maybe it's something related to settings of the emulator. I think I just found something about this game that I kinda dislike. It's something inherent with the game mind you and nothing about the translation. I just finished my first playthrough with Axel in the Super Robot path. And now I'm playing with Lamia on the Real Robot path. On my first playthrough I went to the Guiana Highlands route so I can unlock Daimos's secret final attack. I really thought these attacks would be permanently, or at least automatically unlocked on succeeding playthroughs. I really though these unlock like a few units do namely the Full Armor parts for ZZ Gundam, the Full Armor parts for the OG Gundam and the G-Fighter. But I guess I was mistaken And I really wanted to unlock all the secret final attacks for the trio, Daimos, Voltes and Combatler. Oh and by the way I'm only at chapter five on this playthrough though, so if they do unlock further on please disregard this post edit. Tried to play the game on CFW PS3 (mount ISO, then ISO Remaster Launcher) only to find out I couldn't save. - the original version can still save properly. - if I save in the original version, then try to load with the patched iso, I can see the save, but I get a failure when loading it. - the original iso contains different files for EBOOT.BIN and BOOT.BIN, the patched iso doesn't (the MD5 checksums match). - tried to convert to PKG format through aldo's PSP2PS3 tools, but I got errors about the EBOOT.BIN not being signed (PPSSPP reacts the same, as it won't dump the decrypted eboot on the patched version), and not being signable because it's "an ELF file". So...could that be a bug introduced by modifying the original Eboot file? 1) Fixing the LBA table (somehow something was wrong with EBOOT.BIN's LBA position?). 2) Replacing the patched EBOOT.BIN with the original EBOOT.BIN. 3) Sign EBOOT.BIN with PrxDecryptor.exe in PSP2PS3. 4) Sign EBOOT.BIN with seboot.exe in PSP2PS3. 5) Sign EBOOT.BIN with sign_np.exe. Solutions 1, 3, 4 and 5 will boot all the same, but won't save. Solution 2 won't boot at all. For those interested, this is on a Rebug 2.82 CFW PS3. I tried all of these with the "PSP Remasters Launcher" and I'll try again with the other available Launcher since some subtle differences exist between the two. By the way, a subject came up while researching the issue: it seems that some ASM hacks won't work on the PS3. So just in case, I'm asking: are there any chances that some changes were applied around the syscall initiating the saves? Got a little bug report. Can't easily screenshot at the moment but it's really easy to reproduce.